Dehydrated Castor Oil Fatty Acid commonly known as DCOFA is a high diene Fatty Acid based on Castor Oil. Three types of DCOFA are offered depending on the conjugation (low, medium and high). DCOFA is liquid at room temperature, having a water-white to pale yellow colour. Dehydration of Castor Oil is carried out at about 250o C in the presence of catalysts (e.g., Concentrated Sulphuric Acid, Activated Earth) and under an inert atmosphere or vacuum. Under this condition of dehydration, the Hydroxyl Group and adjacent Hydrogen Atom from the C-11 or C-13 position of the Ricinoleic Acid portion of the molecule is removed as water. This yields a mixture of two acids, each containing two double bonds but in one case, they are conjugated. Dehydrated Castor Oil Fatty Acid based Alkyd Resins and Polyamides make up superior constituent in numerous paint and printing inks formulations. Styrenated Epoxy Esters of these Fatty Acids are used in prime quality Automotive Paints. DCOFA is also used in the manufacture of High Aolid Alkyds, Acrylic and Epoxy Ester Resins, which are useful for interior and exterior can coatings, appliance finishes, automotive topcoats, primers, coil coatings, tube coatings, marine finishes, overprint varnishes and high-speed printing inks. Furthermore DCOFA can be used as chemical intermediate because of their conjugate dienes structure. 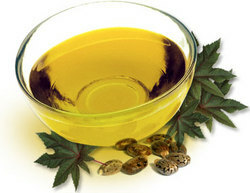 Castor Oil has only one double bond in each Fatty Acid chain and so is classified as Non-drying Oil. However, it can be dehydrated to give Semi-drying or Drying Oil. Ricinoleic Acid is a light coloured Fatty Acid and an Unsaturated Omega-9 Fatty Acid that naturally occurs in mature Castor Plant. It is produced by saponification or fractional distillation of Hydrolyzed Castor Oil. Called Castor Oil Fatty Acid it belongs to a family of the Unsaturated Fatty Acid. It is a viscous yellow liquid, melting at 5.5o C and boils at 245o C and is insoluble in water but soluble in most organic solvents. Ricinoleic Acid possesses remarkable analgesic and anti-inflammatory properties. It is an effective topical treatment material for ringworm, keratoses, skin inflammation, abrasions, fungus-infected fingers and toenails, acne and chronic pruritus (itching). It can also be used for treating leather, rendering good wetting, flexibility and softening properties to it. Hydrogenated Castor Oil, also known as Castor Wax, is a hard, brittle, high-melting odourless solid wax. It is the triglyceride mainly of 12-Hydroxy Stearic Acid and is insoluble in water. This is available as Fully-Hydrogenated Flakes and Powders, Partially Hydrogenated, and in Liquid Form as well. This is non-toxic and non-hazardous material. Hydrogenated Castor Oil is used in high performance coolants and lubricants, cosmetics, electrical capacitors, carbon paper, lubrication, coatings and greases. 12 Hydroxy Stearic Acid is a saturated C18-Fatty Acid that is a pale Ivory coloured, brittle, hard wax like odourless substance derived from hydrolysis of Hydrogenated Castor Oil. It is suitable for its carboxyl and hydroxyl functional groups in various chemical derivatization processes and is available as Fully Hydrogenated Flakes and Powders. It is being used in the manufacture of Lithium and Calcium-based multipurpose heavy duty greases, in coatings in both solvent and water-based systems and as a plasticizer. It is also used as an activator and internal lubricant for natural and synthetic rubbers. This type of derivative is also a source for several important industrial oleo chemicals. © Copyright 2019 Kisan Agro. Developed By Surmi Web Inc.